In Late 2017 Mike Clague was published in the peer reviewed medical journal ‘Aesthetic Plastic Surgery’, with focus on his new cheek filler injection pattern. He was co-published with his colleague from Beverly Hills USA Dr Ava Shamban. Mike and Ava believe that injection of cheek filler should follow the contour lines used by Make-up Artists rather than older traditional injection techniques. Figure 1 (left) is a diagram of the older technique for marking out cheek filler injections with filler (Hinderer’s Lines). These are still commonly used in teaching sessions by doctors and nurses worldwide. The only problem with the older Hinderer’s Lines is that they were designed to be used with surgical implantation of a cheek implant. These lines are not helpful when thinking about the new injectable hyaluronic acid dermal fillers. Mike and Dr Ava presented a new way to mark out the area for cheek filler injection using make-up contour line (seen in figures 2 & 3). 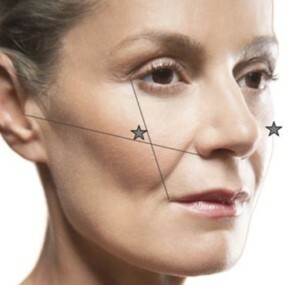 This makes perfect sense and the pair have used this technique to create beautiful cheek filler before and after photos. One of Mike’s patients volunteered to show her before and after cheek filler photos. Mike Clague has been in the medical aesthetic industry for over 14 years and is committed to outstanding results for his clients and online customers. Want to learn more about dermal fillers? Contact us via the form below.